The Stash Dauber: Rocket From the Tombs' "Barfly"
The return of pioneering Cleveland proto-punks Rocket From the Tombs was one of the nicest unforeseen consequences of the resurgence of interest in early '70s American underground rock that followed in the wake of Clinton Heylin's 1993 overview From the Velvets to the Voidoids. A large chunk of Heylin's text focused on the Cleveland scene that produced RFTT, the Mirrors, the Electric Eels, and ultimately Pere Ubu and the Dead Boys. He even compiled Take the Guitar Player for a Ride, a 1994 release of archival recordings by RFTT founder Peter Laughner, an estimable guitarist, singer, songwriter, and music scribe who drank and drugged himself to death from acute pancreatitis at age 24. It took a few more years -- until 2002, to be exact -- for Chicago-based but CLE-focused indie Smog Veil Records to release The Day the Earth Met Rocket From the Tombs, a definitive document of the band's trajectory, compiled from rehearsal room demos and live radio broadcasts. In a surprising turn of events, the surviving band members -- singer David "Crocus Behemoth" Thomas (Pere Ubu), guitarist Gene "Cheetah Chrome" O'Connor (Dead Boys), and bassist Craig Bell (who'd also played in Mirrors) -- regrouped and toured, with ex-Television guitarist Richard Lloyd filling the slot Laughner vacated and Pere Ubu drummer Steve Mehlman rounding out the lineup. They even went into Lloyd's studio to register proper recordings of RFTT's repertoire (released in 2004 as Rocket Redux) that some folks (your humble chronicler o' events included) will tell you trump the 'riginals. In the spring of 2010, a new RFTT single ("I Sell Soul"/"Romeo & Juliet") appeared, and it was announced that a full-length album of new material was in the works. Now Barfly is here, on Fire Records CD and Smog Veil vinyl in the U.S. (you can cop via Pere Ubu's online store or order from your local). While the original RFTT was blazing trails back in '74-'75, today they're revisiting forms that some of 'em (Mr. Thomas in particular) might have thought they left behind years ago. Mainly, it seems that they're enjoying the collaboration and camaraderie with musos they've known for 40 years (their publicity's allusions to "late night dust-ups in the parking lots of cheap roadside motels" notwithstanding). The "art" and "rawk" factions within the band, so fractious the first time around, seem to have made peace musically. Together, they come blasting out of the gate with "I Sell Soul," a churning rocker that borrows its title, but nothing else, from the song Roky Erickson cut with the Spades before joining the 13th Floor Elevators. The band thrashes away at the song's ascending three-chord riff, topped by Thomas' characteristically pinched nasal vocals and lots of red-hot guitar action from Lloyd. The addition of the guitarist, who always got eclipsed by Tom Verlaine in Television but went on to do noteworthy session work (including one of my all-time fave solos on Matthew Sweet's "Sick of Myself," which sounds even more like the world falling apart than Jimmy Page's "Nobody's Fault But Mine" ride), is a fortuitous one. His facility and unconventional ideas are a good fit with the songs, and he and Cheetah have a division of labor like Fred 'n' Wayne in the MC5, or Keef 'n' Brian in the early Stones. "Birth Day" is a slightly different take on relationships than the one Thomas had on Ubu's "Nonalignmnt Pact: "I plan to change the way I feel about you / Plan A, I won't run away / Plan B, I'm a comedy / Plan C, I bang my head / I bang my head against an ever-lovin' wall." Cheetah chimes in with a classic straight-from-Chuck-Berry's-garage double-stopped solo. "Anna" has a crazy stop-and-start momentum and call-and-response vocal exchange that'll take you right back to '76. Thomas quotes Bo Diddley: "Should have heard just what I seen / I'm on the trail of a human being." "Butcherhouse 4" features ultra-creepy extreme-close-up Thomas vocalismo and a backward guitar solo that sounds like a Ring-modulated trumpet, in service of a tale of alienation with charnel-house imagery. "Romeo & Juliet" is the closest thing to a soul ballad that you'd ever expect to hear RFTT play. Thomas as Otis Redding? Lloyd as Steve Cropper? Well, um, yes, but _their way_. Unlikely, but it works. But wait! "Sister Love Train" features a horn section, in the blaring soul band style of the Saints' "Know Your Product." Curiously, it appears back to back with "Love Train Express," which is the same song played sans horns at '76 punk tempo. "Good Times Never Roll" resuscitates the "Sister Ray" riff with some stops 'n' starts, a Thomas vocal like something that slithered out of a swamp, an apathetic Greek chorus of backup vox, and nicely splintered notes from Lloyd. "Six and Two" is the most Ubuesque song here, with Thomas singing, "I wrote a song about you / I asked my friends if they recognized you," a mutated "I Wanna Be Your Dog" riff popping up (the same way it does on "Nonalignment Pact") under the line "I'm at sail on the ship of fools / On the bloody waves of a thousand wounds," and what sound like synth growls during the brief lull before Lloyd's climactic solo. "Maelstrom" boasts smart-dumb lyrics ("I got a phone call / I said 'Yes'") on a par with the ones from the first Stooges album, which even Jim Osterberg seems incapable of writing these days. "Pretty" closes the album with Thomas channeling an end-of-the-bar drunk's closing-time come-on as sweetly as Bukowski (or Waits) might, over a bed of R&B arpeggios. Hence, I suppose, the album's title. 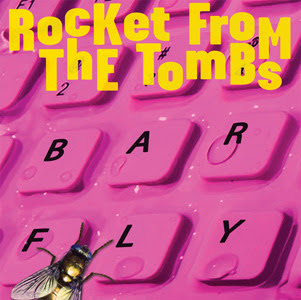 At this point, the resurgent Rocket From the Tombs has nothing to prove to anybody. They're not out to change the world; they did that the first time around, although it took the world (or at least those of its inhabitants who care about such things) a few years to figure it out. But unlike most bands that regroup and record 30 or 40 years down the road, they're making new music that can actually stand up to their history. And that's saying a hell of a lot. HIO - "The Hannah Montana Remix Album"